Call of Duty: WWII is the latest blockbuster gaming experience from Sledgehammer Games. Campaigns range form the beaches of Normandy to the Hürtgen Forest. This game highlights the most dramatic and iconic moments of World War II. As an young soldier facing the unforgiving reality of war alongside his brothers in arms, your objective is clear - Survive and win. Most notably, this is the fourteenth primary installment and first Call of Duty series game to be set primarily during World War II since Call of Duty: World at War in 2008. The game is set in European theater of the war. The campaign centers around 1st Infantry Division and their battles in the Western Front. But, the multiplayer expands on different fronts not seen in the campaign. Some of the iconic historical battles covered in the campaign. They will be the Invasion of Normandy (D-Day), Liberation of Paris, Battle of Aachen, Battle of Hürtgen Forest and Battle of the Bulge. Although the story is primarily set in 1944 and 1945, some parts of it will "touch on" events that happened from 1940 to 1944 .The game is scheduled to be released worldwide on November 3, 2017. This version of the game removes the advanced system of movement present in the three previous Call of Duty titles, which included double jumping and wall running. Instead, it features a return of traditional movement to the series, taking it back to a "boots on the ground" game-play style. Sprint mechanic is not featured in the game as seen in the previous two titles. Here we have a "slide" movement mechanic which allows players to slide quickly on the ground. WWII features a "hit-the-deck" mechanic that allows the player to leap forward and throw themselves on the ground. This is similar to a previous mechanic known as "dolphin dive" in Treyarch's Call of Duty: Black Ops and Call of Duty: Black Ops II. What's most noteworthy is that this is the first title since the original Call of Duty not to feature health regeneration in the campaign. Now players must rely on their medic squad mates to provide health packs. In addition, players need to depend on other squad members to provide ammunition. More over, other squad members can spot enemies there by revealing their position in the form of silhouettes. There are new ways to gain experience. First of which is by capturing the enemy soldiers in the campaign. Second way, helping wounded allies who can be dragged to cover. Finally, both of these actions, as well as killing enemies and completing objectives, add up to player's experience (XP). Which can furthermore be increased and improve the character's skills overall. In some parts of the campaign, players will be able to control vehicles. Infantry: The most versatile division in the game, it is equipped for mid to long range combat. The special skill of this division is the bayonet charge, which can lead to brutal melee combat. Airborne: Players in this division can attach suppressors to sub-machine guns at any time during combat. Consequently, allows for more stealth based gameplay style. Armored: Has the heaviest firepower, being able to mount machine guns and carry rocket launchers as secondary weapons. Mountain: Focuses on long range combat. Sniper rifles are more precise with aim assist. Expeditionary: Shotguns used by players in this division have incendiary rounds that burn enemies to death. WWII also features Headquarters mode, which acts as a social space in the game. The massive hub is set on the Omaha Beach in Normandy. This is three days after the invasion. The Allies retake the beach and turn it into a base. 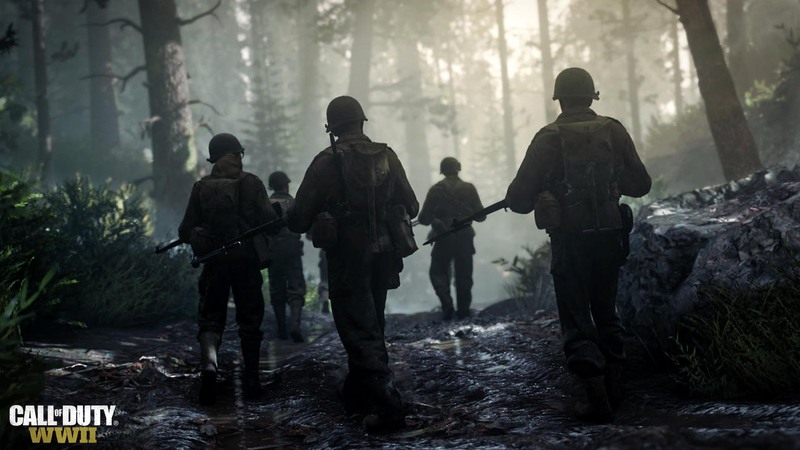 48 players can be in the Headquarters at a time, and take part in various activities. For example, players can watch other players open loot boxes while in the Headquarters. The Hub houses a firing range where players can practice their shooting. There are also areas where players can engage in "1v1" fights, as other players watch the duels. Like “Insidious e.e” replied to me on the Call of Duty Ghosts giveaway, I love this Game. Thank you for Another BIG GIVEAWAY. I hope I win, because this is a very promising game for me 🙂 Good Luck !! I am a long time CoD fan and have been looking forward to playing boots on the ground again. Played the Beta and loved it loads so I think WWII is going to be a blast. First of all many thanks for the giveaway of this awesome game. When I start playing Video Games, the game from Call of Duty was my 2nd game and then I addicted to this series and played all. I would be lucky to get my hands on this one to continue my experience with Call of Duty series. Awesome! Thanks for this great giveaway. Probably the better game on WW2. Awesome giveaway. Pingback: Saints Row: The Third Game Giveaway, register your entry now! Pingback: Mortal Kombat X Game Giveaway, Register your entry now! Pingback: Dead Space Game Giveaway, checkout other giveaways too! Honestly I quit playing this 2 weeks in.